This ministry would not be possible without you our co-laborers in the harvest. 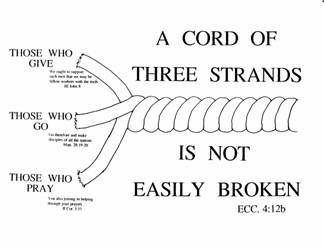 The Word of God makes it very clear that the ministry is a threefold cord. A close friend of mine, Mark Lewis, who directs the collegiate ministry in Texas and is a former missionary to Africa, often quotes William Carey, the founder of modern missions, “If you will hold the rope, I will descend to the pit…” This “rope” is a cord of three strands. As sacrificial is it may be, this ministry of “going”, could not be sustained without the other three cords. II Corinthians 1:11 states, “ you also joining in helping us through your prayers, that thanks may be given by many persons on our behalf for the favor bestowed upon us through the prayers of many.” God makes it clear here and in other passages that those who pray are equal in their labors with those who go. They are co-laborers. Not only that but their prayers make a real difference in events on the mission field. III John 1:8 states, “Therefore we ought to support such men, that we may be fellow workers with the truth.” Again, a co-laborer with the one who goes. Now if man were teaching this it would be easy to dismiss this as simple salesmanship. But God has no need of salesmanship. In God’s economy of ministry those who Go, those who Pray and those who Give are all co-laborers, sharing equally in the call to minister and in the eternal rewards of this great call. We take this ministry seriously which is why we try so hard to keep you informed and updated with payer requests. We are all co-laborers together and these are exciting times to be involved in the harvest fields of the world. 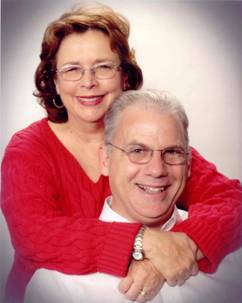 We praise God for your sacrificial friendship, prayers and financial support which has made our ministry possible. Words cannot express to you our appreciation for your decision to join us as co-laborers in the harvest fields of the world. Our greatest joy is to know with confidence that all you do is for the Lord’s glory and that He will reward you on that day when we all stand together before the throne of glory. but I seek for the profit which increases to your account.